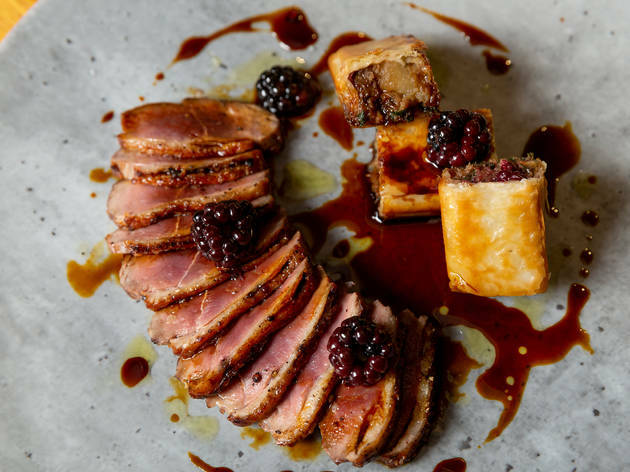 Venue says Between Clapham Junction and Wandsworth Town, we strive to deliver exciting dishes, from around the world in a cosy and relaxed atmosphere. 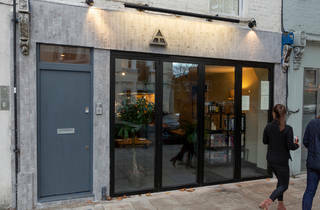 A small, modern European restaurant on St John’s Hill. At first, I was calling Hatched a neighbourhood restaurant. But it’s not. Not really. Because first of all, St John’s Hill isn’t a neighbourhood – no matter what that shiny-faced local estate agent may tell you – but a traffic-clogged A-road linking Wandsworth Town to Clapham Junction. With the occasional strip of shops. And also, because the words ‘neighbourhood restaurant’ might give you visions of a jolly, cosy spot for a cheap ’n’ cheerful Wednesday night out with your housemates. It’s not that either. 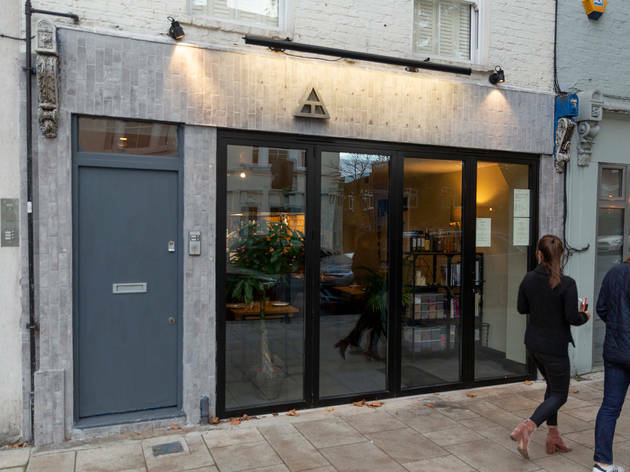 Instead, Hatched is a simple, stripped-back space for people who are Serious About Food. Dishes are modern European. The menu is short and confident. It says: ‘we know what we’re doing’. And they do. Everything I ate was excellent, from bouncy octopus tentacles over a red pepper salsa to fatty-edged lamb chops with a pimped-up pot of moussaka (its creamy, foamy top layered over shredded, confit-esque lamb). Even better: a plate of gnocchi, each pillowy bite swaddled in a silky chive-spiked sauce and one of three kinds of springy wild mushrooms. Or a cheerful salad of red and yellow courgette, woven through with delicate white crab meat. And last (though, as a snack, it comes first), the beef cheek arancini. A bargain £3.75 gets you a humpty and dumpty: two rotund fellas, their golden coats crisp and hot, with stewed insides intensely meaty. But the step-forward-and-take-a-bow-please star of the night was pud: a retro pain perdu. A huge brick of french toast, it had a spongy middle and a crisp, caramelised, burnt sugar edge. It would have been beautiful just like that, but it also came with generous shards of honeycomb and a scoop of velvety vanilla ice cream. This is a dish to give the version at two Michelin-starred Le Gavroche a run for its money. Guard jealously. Not that Hatched is perfect, mind. Given the spartan decor (tiled grey floors, bare walls), the lights are too bright. Service is genial, but the pace frustratingly leisurely. And while portions are large, they’re also not cheap (tip: share what you can). But for W1-quality food in SW11, you’ll struggle to find better. Hatched is a new and creative restaurant nestled between Clapham Junction and Wandsworth Town, in the heart of St John’s hill. 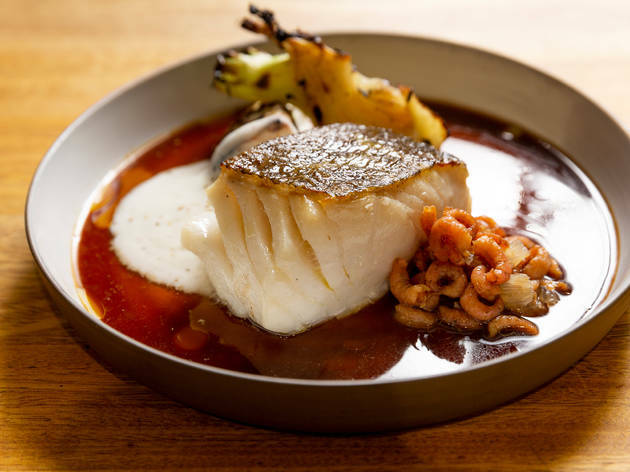 The restaurant is the culmination of a dream held by the Head Chef and owner Shane Marshall and is the result of years of design and planning. As the name implies, Hatched has evolved from a simple beginning to a successful restaurant which aims to provide an excellent dining experience. 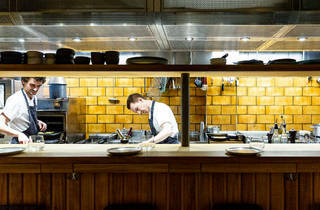 Shane puts his twist on dishes he has learned working at hugely successful fine dining restaurants including La Petite Maison, Tom Aikens and Capital House to develop exciting modern dishes with the freshest ingredients, which are being enjoyed in our cosy and relaxed atmosphere. Shane’s vision is that he “wants every guest to feel at home the second they walk through the door. We are aiming for an intimate, clutter free dining experience, where you forget your phone and spend time with the person you’re with and re-establish real connections”. The food sharing concept is very important at Hatched, this gives the guest the best chance to try a range of dishes and tastes and create a wider dining experience. Hatched's quality does not stop with its food. The cocktails and selected bottled beers are worth a visit alone. The barmen are highly skilled mixologists, who love to be creative and ensure you leave highly satisfied and maybe a little tipsy! 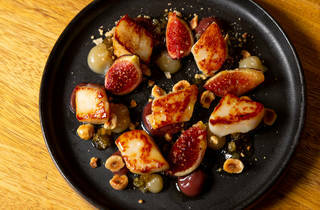 Dinner for two with drinks and service: around £120. Superb food ***** when it finally arrived but truly appalling service. Had to beg for menus, wine and weren’t even offered dessert or coffee. Same experience as Gary G below. Such a shame. Truly appalling service. Reserved a table for Valentine’s Night. Arrived on time but left waiting in lobby unaknowledged for several minutes. When asked to be seated the waiter waved us away. Had to find our own table. Nothing for 15 minutes. Nothing for 15 minutes. Got up to ask for some water (not least because my wife was having a coughing fit) to be told by the waiter that he had a whole restaurant to serve. Eventually he slammed a bottle of water down on our table and stomped off. Asked for the menus to be told that I should know the menu was a set menu. Noticed every other table had glasses of champagne and asked if we could please have ours, waiter replied that we wouldn’t get one as we had been rude to him. Got up and left. Outside an episode of Fawlty Towers, I haven’t really experienced anything quite like it. Judging from some other reviews this does not appear to be a one-off. 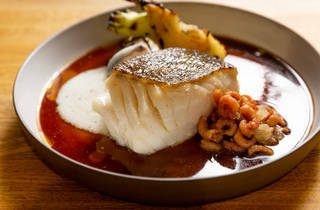 If the food is as good as the reviews suggest the talented head chef Shane Marshall risks ruining his restaurant’s reputation unless he deals with the service issue. Best avoided until this is sorted out. (PS: on returning home I received a mocking email from the restaurant enquiring if I enjoyed Valentine’s Night together with laughing emoticon. Oh dear. I think certain individuals employed by Hatched need to reassess if they are truly cut out for the hospitality industry). Amazing food in a relaxed environment with super friendly staff. Love sitting up at the bar and watching the action in the open kitchen. Beef cheek arancini are an absolute must - 10/10! 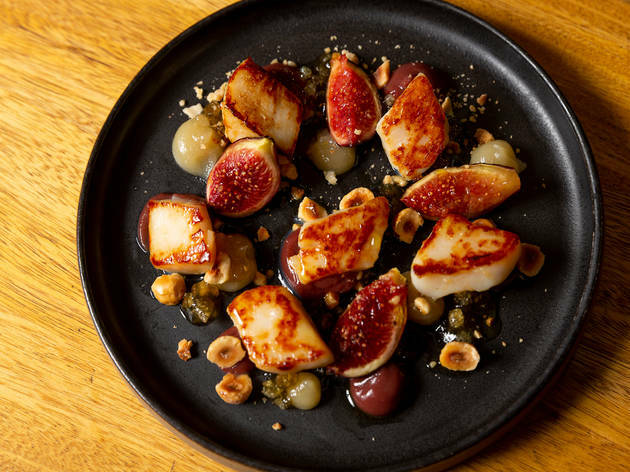 Having enjoyed both evening and Sunday lunch at Hatched the food has always been exceptional and such a high standard that it would be difficult to match it anywhere. The staff are excellent and very helpful, do ask the chef Shane for his recommendations and if you can sit at the bar and watch them work their magic. Real value for money for the quality. Can’t wait to visit again and enjoy the unique experience. Lovely atmosphere with exceptional food. I came back for a Sunday roast after experiencing the A La Carte menu. Particular highlights were the Gnocchi dish, scallops dish and the beef arancini balls. Really good value for money considering the level and quality of food and ingredients. Great to see this cracking little spot in TimeOut today. 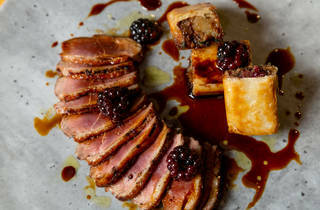 I've had some brilliant occasions at this restaurant and it serves up delightful food, whether you're having a light bite at the bar or a barn-storming Sunday roast. We love this place and glad it's now getting the recognition it deserves. We've been a few times and everything we've tried has been delicious, some of the best food we've had in London. The staff are great - the chef's take time to talk you through the dishes and the waiter made some excellent wine recommendations. The cocktails are fantastic too and made to your preference. Would also recommend their Sunday roasts. All in all a fantastic restaurant and we're looking forward to our next visit. A real local gem, the food was all superb and the waiter gave an excellent wine recommendation that was fairly reasonably priced which complimented our dishes. The cutlery draws under the tables are a cool feature, I’ll definitely be back soon perhaps to sit at the bar and watch chefs work their magic. Lovely neighbourhood restaurant with a relaxed atmosphere and quality food to go with it. I personally love the sharing style menu as I can never choose and you really could order everything on the menu. With a good bottle of red or two you can lose your self for hours. Been here a few times and I can't wait for my next visit . Try and get a seat at the bar overlooking the kitchen. It's great watching the chefs work their magic and the food seems to taste even better after watching the care that goes into preparing it. I’ve been here on a busy Friday evening and a bustling Sunday afternoon and both were equally excellent! Food was superb with menus based around delicious seasonal ingredients- we struggled to choose. Best advice - ask the waiters what they would have and then order the whole menu. Staff are friendly and knowledgable, setting is relaxed and not too stuffy. Highlight is sitting kitchen side and watching the chefs cook in the open kitchen. Different menu on Sunday - best Sunday lunch myself and my family have ever had. Love this place - we will be there again soon. Excellent local restaurant with great staff and excellent food- small plate British twists. All courses are lovingly crafted with plenty of thought put into each dish. Open kitchen chefs table style environment.